Firstly, I apologize for the lack of Tuesday reviews the past couple of weeks. I was busy packing for the move, then moving, then unpacking and sorting out my new life in Sweden hence the lack of posts. And this leads me to today’s review. Given that I spent most of December 24th unpacking the last of the boxes, Christmas Eve – which arrived with a delightful flurry of snow – was spent with a bowl of chicken soup in front of the PC watching Guardians of the Galaxy. To be honest, I haven’t read that many actual comics and my childhood was spent devouring Tolkien-esque epic fantasy not pages by Marvel and DC. That said, since discovering the wonder of the graphic novel as a slightly older young adult, I’ve been fully committed to watching everything Marvel has to offer. (I’ve been less ecstatic about DC offerings thus far) so of course Guardians of the Galaxy (from now referred to GoftG) was a film I knew I was going to watch regardless what the reviewers said. Turns out, this film got rave reviews and that left me a little skeptical. I tried going into this film having no to low expectations and I think that certainly helped me enjoy this film a lot more than I might have otherwise. Humour is a bit of a hit and miss with me. Much of what passes as comedy with general movie-goers falls flat with me and I tend to outright avoid comedies because of my… let’s call it ‘quirky’ sense of humour, so after reading reviews calling GoftG ‘hysterical’ and ‘laugh out loud’ funny, it was with much trepidation that I settled down to watch. With baited breath I awaited the accursed voice-over giving me a run down of the world and how space politics came to be yadda yadda and surprise surprise, it never happened! Kudos GoftG for not pandering to your audience with narration! Five stars awarded in the first three minutes! But what wasn’t explained to the audience with clunky narration was sneaked into expository dialogue that made my eyes twitch a little. Still, it wasn’t as bad as it could’ve been so I’ll forgive these moments of exposition because I was definitely being entertained. While others criticized films like Battleship and John Carter, I found both extremely entertaining and really funny. GoftG joins these two on my shelf of ‘highly entertaining when you don’t really want to engage your brain.’ For two hours, I found myself snickering at the jokes – particularly those by Rocket – and rooting for the unlikely bunch of misfit heroes. Yes, cliches abound and much of the movie could be seen as a patchwork borrow/steal from just about every other science fantasy film ever made, but I still enjoyed it immensely. It’s good old-fashioned swash-buckling space adventure with a lovable, if hardly smart, bunch of underdog heroes and a creepy villain who is also less than competent most of the time. I did, however, feel that Lee Pace was under utilized here. He took my breath away in The Fall and is pitch perfect in The Hobbit so I would’ve loved more from him here as the villain. With a two hour running time, I was afraid this movie would feel long the way certain X-Men films have, but GoftG managed to keep up the pacing and keep me enthralled until the very last scene at the end of the credits. 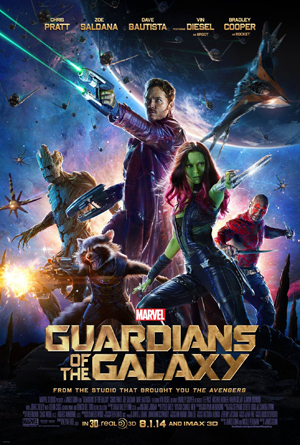 While some of the other Marvel films have taken a turn toward darker themes, GoftG keeps things light and frivolous with blood conspicuous by its absence despite a fair bit of violence, jokes mostly clean – sadly, I think some more ribald humour for the adult audience ala Shrek would’ve worked well given the characterisation of Starlord – and the general ambiance of the film one of feel-good adventure. I’m not sure how the tone of this film will fit into the greater Marvel picture given the bleak undercurrent in the Captain America films, the darker characterisation of Tony Stark, and the corrupt – and awesome – villainy of the likes of Loki, but it definitely feels like a much needed breath of fresh air given the sometimes overbearing canon into which it fits – well, sort of fits. Overall, GoftG didn’t impress me, but it definitely didn’t disappoint and was exactly the sort of brain-vacation entertainment I wanted. This scores 3.5/5 ink splats from me and I’ll probably – definitely – be watching the sequel.